Hydrochlorothiazide is a diuretic that treats water retention by reducing the amount of salt absorbed by the body. This is especially important in patients with high blood pressure, kidney disorders and diabetes. Diabetes is a metabolic disease characterized by high levels of sugar in the bloodstream. Diabetes increases your risk of heart disease, blindness and stroke. Combining certain medications with diabetes can cause adverse reactions, so you must know how hydrochlorothiazide affects your blood sugar. Insulin is a hormone produced by the pancreas that changes food into energy. When your cells become resistant to insulin or your pancreas quits making insulin, diabetes can develop. There are two kinds of diabetes, but diabetes type 2 is the most common form of the disease. As of 2011, more than 25 million Americans have diabetes, according to the American Diabetes Association. Symptoms of diabetes include increased thirst, vision changes, hunger and increased urination. Diabetes increases your risk of stroke, heart disease, blindness and kidney disease. Physicians treat diabetes with dietary changes, oral medications and insulin injections. Diuretics are a family of drugs used to treat fluid retention associated with kidney disease, heart disease, diabetes and other disorders. Diuretics are sometimes called water pills, because they increase urination to remove excess fluid in the body. This not only reduces swelling, but also reduces blood pressure. Hydrochlorothiazide, or HCTZ, is a thiazide diuretic that works by reducing the amount of sodium your body absorbs. HCTZ is often prescribed for high blood pressure, congestive heart failure and kidney disease. Some patients have reported diarrhea, mild stomach pain, constipation and blurred vision while taking HCTZ. Seek immediate medical attention for severe allergic reactions, such as difficulty breathing, hives and swelling of the face, lips or throat. A study published in the October 2009 edition of “Cell Biochemistry and Function” noted an increase in glucose levels when combining HCTZ therapy with a high-fat diet. The combination caused a pronounced increase in blood lipids and blood glucose readings. In addition, Daily Med recommends physicians closely monitor diabetic patients taking HCTZ due to a risk of increased blood sugar levels. This may be due to an inadequate release of insulin while taking HCTZ. 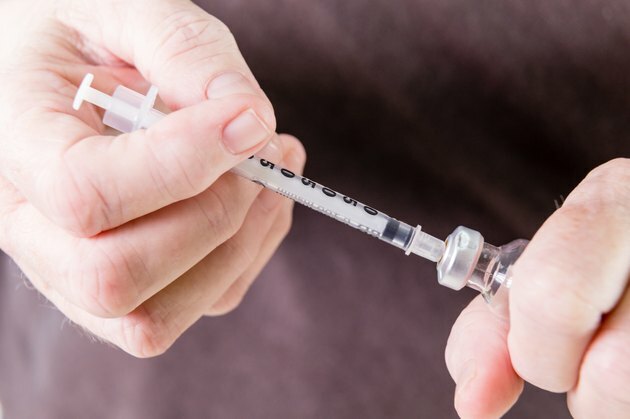 Physicians may have to change the dosage of insulin injections and oral medications for diabetic patients taking HCTZ. Although rare, diabetes sometimes manifests in patients during hydrochlorothiazide therapy. Hydrochlorothiazide can cause sudden drops in blood pressure, resulting in dizziness, fainting and loss of balance. HCTZ may cause sensitivity reactions in patients with asthma and breathing disorders, so tell your doctor if you have one of these disorders. People who are allergic to sulfa drugs may experience the same reaction with HCTZ. Physicians often prescribe blood work to check for kidney function while on HCTZ therapy. HCTZ can cause adverse reactions, including weakness, low blood pressure, muscle cramps and yellowing of the eyes or skin. Take hydrochlorothiazide only when prescribed by a physician.